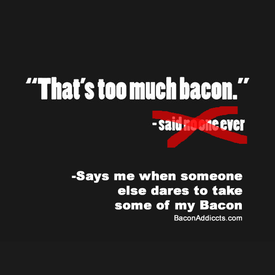 Bacon Addicted - Your guide to everything bacon. 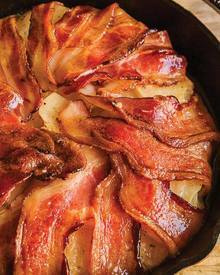 Strata, breakfast casserole, savory french toast bake or bread pudding. It doesn't matter what you call this, it's totally delish and can be made ahead so it's great for feeding a crowd! 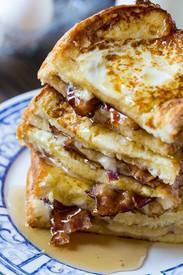 It’s something a little different and requires just FIVE ingredients – bacon, eggs, cheese, milk and bread. 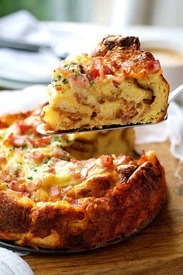 It tastes like a cross between a quiche, french toast and an omelette! 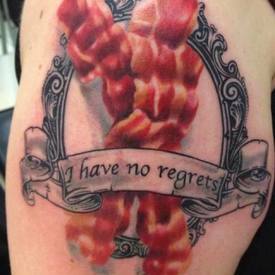 Thinking of getting a tattoo...? 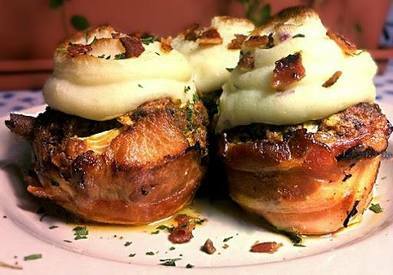 These mashed potato topped, Bacon-wrapped mini meatloaves are the whole package. Individually sized, perfectly proportioned to give you just the right ratio of meat and potato, and there’s no craving too big for one or two of these to handle. Make them for dinner tonight! 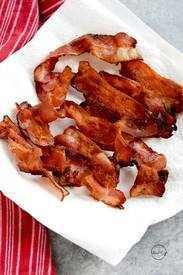 Bacon is stuffed between 2 pieces of bread lathered with a cream cheese/brown sugar mixture. This is the ultimate sweet and salty breakfast! 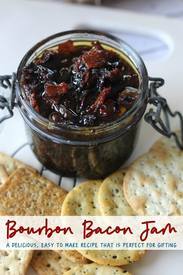 If you believe that everything tastes better with Bacon, you're going to love this recipe! 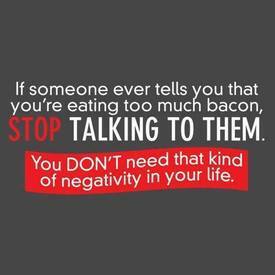 Less talking, more Bacon eating. If you love garlic knots, you need these Bacon knots in your life STAT. 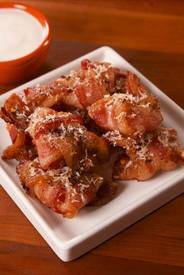 No bread needed with these Garlic Parm Bacon Knots from Delish! You're KNOT going to believe it!! 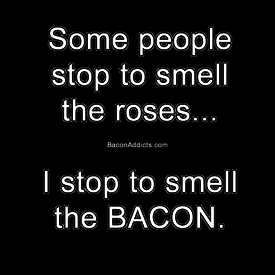 Bacon is the perfect snack. 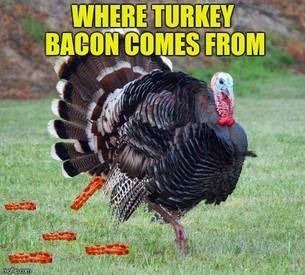 With GoBacon jerky you can take Bacon everywhere! 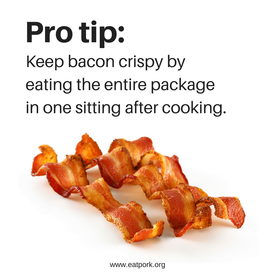 Enjoy Bacon at work, in your car, at school, on a hike ...anywhere you want Bacon, you can now eat Bacon!! Made with 100% real Bacon. 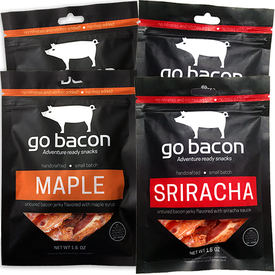 GoBacon is handcrafted in small batches, with No preservatives, No Nitrates or Nitrites, and No artificial ingredients. The perfect formula for when you're adventuring in the great outdoors and doing whatever else you claim to do on social media. 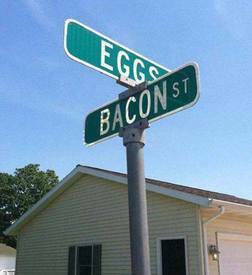 Where will you take your Bacon? Sorry, but even one slice is just waaay too much!! With a touch of whiskey! If you didn’t know already, salty sweet is hands down the best flavor combo, and these Maple Bacon Cupcakes definitely do not disappoint. 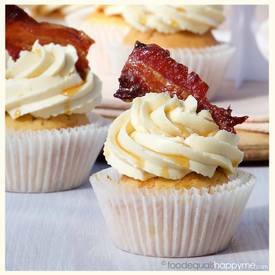 It all starts with a brown sugar and whisky cupcake, topped with a lusciously smooth salted maple buttercream and finished candied maple Bacon. Salty sweet magical goodness! I knew there was a reason why I always eat the whole pack!! 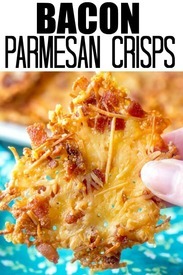 These crispy, crunchy and cheesy Bacon Parmesan Crisps from Tornadough Alli are a delicious low carb snack that aren't only addicting but also quick and easy to make! 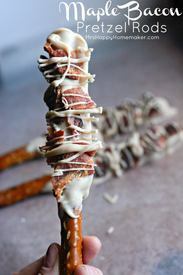 We like quick and easy snacks... and everyone love cheese and Bacon!! 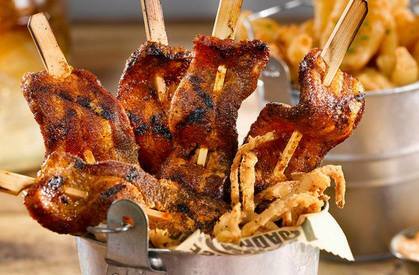 Combine all of this into one and make these super addicting Bacon Parmesan Crisps!! 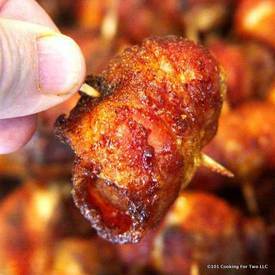 This Sweet and Spicy Chicken Bacon Bites recipe from 101 Cooking for Two has a skill level of 3/10, and a deliciousness level of 10/10. Plus it is easy to double or triple if needed. 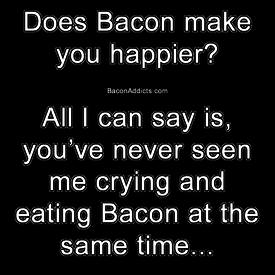 To be honest, it has never occurred to me to cook Bacon in in air fryer? 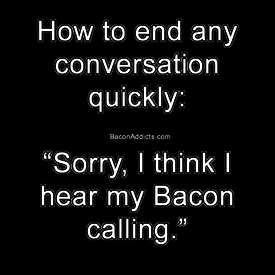 But, Marjorie at A Pinch of Healthy reports: "After you try this method for cooking bacon, you may never do it any other way. It’s a total game-changer, people." Why? It is so much easier and less messy than stovetop, microwave or baking in the oven. It is simple, mostly hands off, plus the grease effortlessly falls off into the lower reservoir. The end result...crunchy outside, chewy inside, dark around the edge - just perfect!!! I just might have to give this a try? Would you? 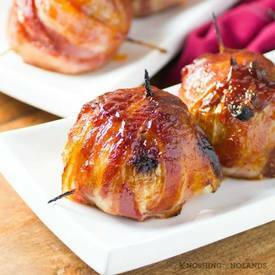 These BBQ Bacon Wrapped Onion Bombs from Noshing with the Nolands look fabulous and trust me are even better to eat!! What is not to love, a big huge meatball stuffed with cheese encased in onion and then wrapped in Bacon and slathered with BBQ sauce. How many of these could you eat? 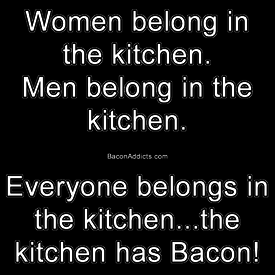 When you are making Bacon, everyone is always in the kitchen! !